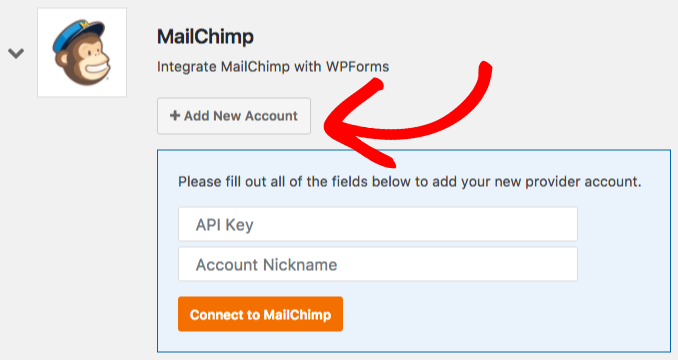 In this tutorial, we’ll show you how to use our Mailchimp addon to integrate WPForms with your Mailchimp lists. Requirements: You will need a Plus license level or higher to access the Mailchimp addon. Once the core WPForms plugin is in place and your license is verified, you’ll be able to quickly install and activate the Mailchimp addon. Now that the Mailchimp addon is installed, the next step is to integrate with your Mailchimp account. To do this, you’ll need to go to WPForms » Settings and then click on the Integrations tab. When you open the Mailchimp option within this tab and click the + Add New Account button, you’ll be able to see additional fields for API Key and Account Nickname. Now that you’ve completed the initial setup for the Mailchimp addon, you’ll need to add the API key. The API is what allows the WPForms plugin on your site to communicate with your Mailchimp account. Each Mailchimp account will have a unique API key. To access this, you’ll need to log into your Mailchimp account. Since we’ll come back to your WPForms settings later, we recommend opening the Mailchimp site in a new tab or window. Once you’re logged into Mailchimp, you’ll need to go to your Account page. Within the Account page you’ll see an additional menu near the top of the page. From this menu, you’ll need to go to Extras » API keys. 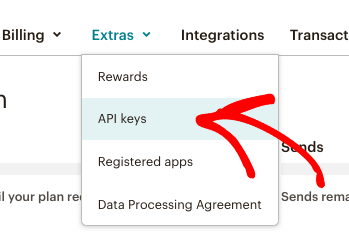 When you open the API Keys page, you’ll be able to copy your existing API key or, if needed, generate an API key by clicking the Create a Key button. After you’ve copied the key, you can return to the tab or window with your WPForms settings and paste it into the API Key field. You’ll also need to fill out a nickname for this connection. 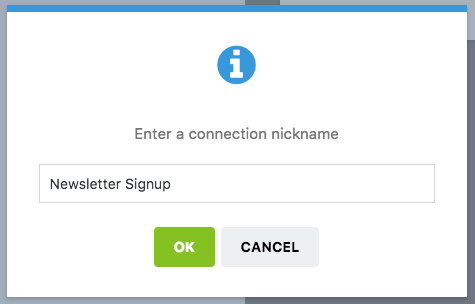 This name will only display in the form builder (it won’t ever be visible to your users), and is meant to help if you add additional Mailchimp accounts down the road. When you’re ready, click the Connect to MailChimp button to save the connection. The final step is to add Mailchimp integration to specific forms on your site. To do this, you’ll need to create a form or edit an existing form. After opening the form builder, go to Marketing » Mailchimp and click the Add New Connection button. This will cause an overlay to appear, and here you can enter a nickname for the connection you’re creating. This is useful if you plan to connect this form to more than one mailing list, however it’s simply to help with organization and your users will never see it. 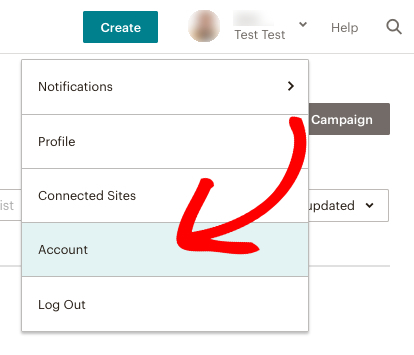 Once a connection is created, you can choose from any Mailchimp accounts you connected in Step 2. Note: All Mailchimp mailing lists must be created in your Mailchimp account. For more details, check out Mailchimp’s tutorial on getting started with lists. Under the List Fields section, you’ll see all of the available fields for subscribers to your Mailchimp mailing lists. The only field you’re required to fill in is Email Address. This all you need to complete your connection to Mailchimp! To send additional entry fields to Mailchimp, you’ll need to map your form fields to any available fields in Mailchimp. As noted above, the Email Address is required. However, any other fields you see are optional. 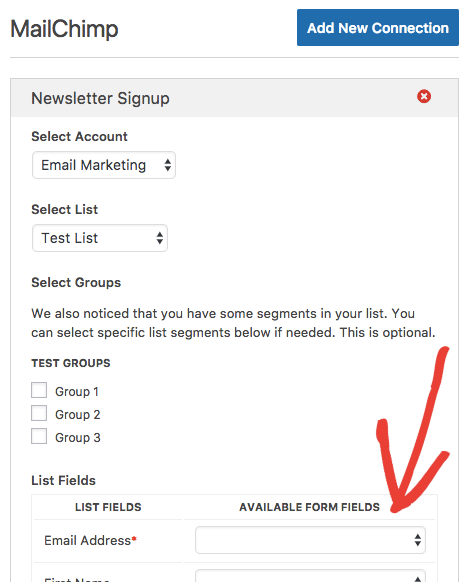 If you’d like to add more fields to your subscriber profiles, please check out our tutorial on setting up custom Mailchimp fields. Within Mailchimp, you can also choose to further divide your mailing lists into Groups. If you’re not familiar with this option, please see Mailchimp’s tutorial on Groups for more details on what they are and how Mailchimp recommends using them. If you’ve set up any Groups in the mailing list you’ve selected, those will automatically be displayed in the Select Groups section. For example, you could use conditional logic to allow users to choose if they’d like to be added to your mailing list. You can also apply conditional logic to the Groups described above. If you’d like to learn how to do this, please see our tutorial on how to allow users choose which groups they get added to. When enabled, double opt-in will prevent users from being automatically added to your Mailchimp lists. Instead, they’ll receive an email asking them to confirm their subscription. The user will only be added to your mailing list after they’ve clicking the confirmation link in that email. For more details, please see Mailchimp’s tutorial on using double opt-in. Note: Configuring Mailchimp to send newsletters “from” free email service providers accounts, specifically Yahoo and AOL, can and will result in email delivery issues. For more details, please contact Mailchimp support. That’s it! You can now set up Mailchimp integration with any forms on your site. Would you like to grow your subscriber list even further? Check out our tutorial on leveraging lead magnets to learn how you can offer potential subscribers incentives to subscribe to your mailing lists. Changed: Birthday field special integration rules. Changed: Improved localization support and translatable strings. Changed: Update MailChimp PHP library (2.4).